About this time of year, in the colder regions where some of us live, many people come down with a case of cabin-fever. You know, the blahs, doldrums, sick and tired of this cold, dreary weather that is putting its damp on my style. Among the remedies for cabin-fever featured on television are construction projects, home improvement ideas and beautifully landscaped displays resembling the Garden of Eden. 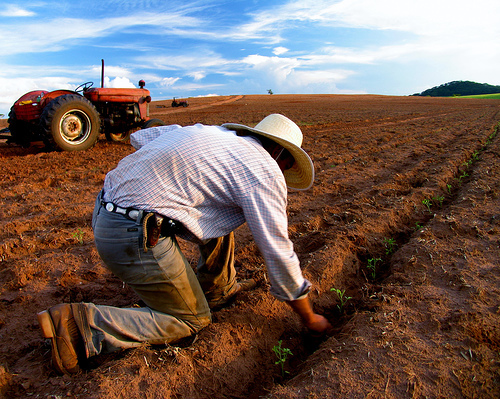 I, myself, begin to dream of the possibilities of what the planting season will bring and get the “green-thumb urge” to go out into the fresh air wearing my work clothes, gloves and boots and begin sowing seed. I thought about this passage many times before, but in regards to the context of verse nine; primarily how much of a crop is produced. Recently, a friend spoke to me about my writing and the neighborhood ministry I had been working on for the past several years. She expressed how I had let it fall by the wayside. I couldn’t get the phrase, “fall by the wayside” out of my mind so I googled it . There in verse four of the King James Version, I read a similar expression, “some seeds fell by the wayside, and the fowls came and devoured them up.” I’ve thought about the neighbors/readers who may have been searching for Christ, and how I neglected sowing the seed of love. How many opportunities to reach out to them fell by the wayside? I’ve resumed writing and have gotten the “green-thumb urge” spiritually to plant the seed of love by helping others in my neighborhood find peace, love and forgiveness through Jesus. 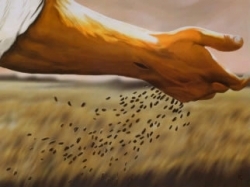 I encourage those of you who read this post to think about how God may want you to sow seed. Do you sense an urgency to do something God has planned for you alone to do? Perhaps you have a desire to visit the sick, work the line in a soup kitchen, donate clothes that you don’t need to those who have little, or reach out to a neighbor. Perhaps you have an emptiness within, the blahs or lack an interest in spiritual things? Are the activities in your schedule crowding out time that could be spent serving God? Do you hear God calling you to plant seed for his kingdom so it will produce a crop that is a hundred, sixty or thirty times greater than what was sown? Let’s get busy about his business of planting seed. Father, help us make you our priority each day. Forgive us for missed opportunities and help us sow the seed you’ve given us while it still may be planted in the hearts of men and women.